Around Christmas each year there are always those who decry the use of the abbreviation "Xmas" as some kind of blasphemy against Christ and Christianity. This concern has been elevated recently with the public debates about manger scenes and the substitution of "holiday" for "Christmas" in stores and government venues. Among some religious folks, the objection to Xmas is usually along the line that people have taken Christ out of Christmas and replaced him with an unknown (since the Greek letter chi, [C,c] which looks like the English letter x, is the symbol for an unknown quantity in mathematics). For example, on the "Voice of Prophecy" web site is an article entitled "You Can’t 'X' out Christ." You’ve heard the classic story about the little boy who noticed the huge red-and-green sign spray-painted on a department story: "Happy Xmas." And he wondered aloud about the X. Why was it X-mas? And finally, in a forlorn voice, he asked his dad: "Did they cross Christ out of Christmas, Daddy?" And the father had never thought of it that way before, but finally nodded. "Yes, Son, I guess they did." And it makes you think. Well it certainly does make one think. The story illustrates what could have been a marvelous opportunity to teach a child about some of the important symbolism of the Christian Faith. But it was an opportunity lost, in this story at least, because many Christians do not understand their own iconography and symbolism. The results are often battles waged against windmills while far more consequential issues for the Faith are neglected (a modern example of Matt. 23:23). Now, in all honesty, the article on that web site focuses on the secular commercialization of Christmas, something to which most Christians I know would object or at least with which they are uncomfortable. But the fact that the use of "Xmas" can be associated so easily with crass commercialization rather than locating it within the Christian tradition itself reveals a lack of understanding of heritage and history. The time has come to separate the religious festival of Christmas from the trading season of "xmas." 4) Emphasizing Santa Claus over Baby Jesus. Certainly, the question does not imply what the web site itself thinks of the answers. But the fact that this issue can still be included with the other fears that people have about Christmas illustrates a continuing and significant level of misinformation mixed with people’s concerns. And the less than neutral language of the question ("world," "attacking," "Christian") certainly leaves the impression that using "Xmas" is part of some worldly plot to overthrow Christendom. This misunderstanding about the use of "Xmas" is not a new phenomenon. I heard the same kinds of comments in sermons many years ago. It was especially prevalent among those Christians and church leaders who wanted or needed to see the world in negative and threatening terms (see The Jonah Syndrome), or who tended to see everything in secular society either as part of some grand conspiracy of Satan or the inexorable working out of God’s own predetermined plan, without really knowing all the facts or complexities of the situation (see Christians and Urban Legends). I have no doubt that some people write "Xmas" because they are too busy or too lazy to write out the whole word. And no doubt some secular people, who are just as uninformed as Christians, see "Xmas" as a way to avoid writing "Christ." And certainly there are secular and commercial motives in the fact that "XMAS" appears in ads and signs because it can be larger and more attention getting in the same amount of space (more bang for the buck). But those factors do not take away the thoroughly Christian origin of the word "Xmas." In this instance, all of the concern over supposedly taking Christ out of Christmas by writing "Xmas" instead of spelling out "Christmas" is misdirected. Abbreviations used as Christian symbols have a long history in the church. The letters of the word "Christ" in Greek, the language in which the New Testament was written, or various titles for Jesus early became symbols of Christ and Christianity. For example, the first two letters of the word Christ (cristoV, or as it would be written in older manuscripts, CRISTOS) are the Greek letters chi (c or C) and rho (r or R). These letters were used in the early church to create the chi-rho monogram (see Christian Symbols: Christmas Ornaments), a symbol that by the fourth century became part of the official battle standard of the emperor Constantine. In any case, by the fifteenth century Xmas emerged as a widely used symbol for Christmas. In 1436 Johannes Gutenberg invented the printing press with moveable type. In the early days of printing typesetting was done by hand and was very tedious and expensive. As a result, abbreviations were common. In religious publications, the church began to use the abbreviation C, or simply X, for the word "Christ" to cut down on the cost of the books and pamphlets. 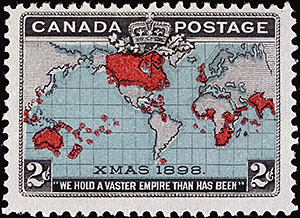 From there, the abbreviation moved into general use in newspapers and other publications, and "Xmas," along with the abbreviations Xian and Xianity, became an accepted way of printing "Christmas" (at right is a postage stamp issued by Canada in 1898 with "Xmas"). Even Webster’s dictionary acknowledges that the abbreviation Xmas was in common use by the middle of the sixteenth century. So there is no grand scheme to dilute Christianity by promoting the use of Xmas instead of Christmas. It is not a modern invention to try to convert Christmas into a secular day, nor is it a device to promote the commercialism of the holiday season. Its origin is thoroughly rooted in the heritage of the Church. It is simply another way to say Christmas, drawing on a long history of symbolic abbreviations used in the church. In fact, as with other abbreviations used in common speech or writing (such as Mr. or etc. ), the abbreviation "Xmas" should be pronounced "Christmas" just as if the word were written out in full, rather than saying "exmas." Understanding this use of Christian symbolism might help us modern day Christians focus on more important issues of the Faith during Advent, and bring a little more Peace to the Christmas Season.